i-Clean Systems Ltd is proud to mark another milestone in its success by celebrating its 10th year in business. The company based in Worcestershire, specialises in best practice benchmarking for cleaning and waste management, supporting clients and service providers to implement best practice measures and drive continual efficiency improvements. 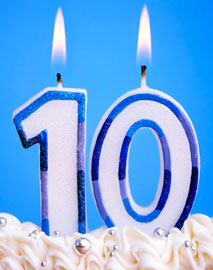 We are very pleased to have reached our 10th anniversary and proud of our acheivements during that time. Over the last 10 years we have built an enviable customer list across all sectors, which includes some of the most prestigious organisations in the Country. We have continually developed our reviews to keep pace with best practice recommendations and worked tirelessy to drive industry standards. As a result, demand for best practice benchmarking is growing year on year and we look very much forward to the next 10 years and beyond. Mike Boxall, Managing Director i-Clean Systems Ltd.